Boysenberry vs. Blackberry: How Are They Different? Home > Food Facts > Berries > Boysenberry vs. Blackberry: How Are They Different? Boysenberry vs. blackberry. Both are amazing berry fruits that jam and pie connoisseurs greatly appreciate. They are similar in many ways, and actually belong to the same plant family—Rosaceae. At the same time, these berries have distinct differences that set them stand apart from one another. For instance, the blackberry is a small, genuine berry, whereas the boysenberry is a larger hybrid berry that is a combination of a type of blackberry (Allegheny blackberry or common blackberry) and the Pacific berry, loganberry, European raspberry, and American dewberry. Blackberries are also much sweeter than boysenberries. In this section, we will examine the physical properties of boysenberry vs. blackberry. Both berries belong to the rose family, called Rosaceae. It is one of the largest plant families, with nearly 3,400 species including plums, peaches, apples, cherries, the hawthorn tree, and, of course, berries, among many others. Both blackberries and boysenberries also belong to the subgenus Rubus. How do these berries stand out from others? Blackberries and boysenberries have a pulpy or fleshy fruit where the entire ovary wall ripens into a relatively soft pericarp, and the seeds are embedded in the flesh of the ovary. In other words, the core is intact rather than hallow with drupelets separate, as with the raspberry. What are some of the differences in characteristics? Blackberries have a pure black color. Boysenberries, on the other hand, are a perfect blend between blackberries and raspberries when it comes to color and texture. As a result, boysenberries have a dark purple and reddish blue color. Also, the seeds of blackberries are larger than boysenberry seeds. And boysenberries are more fragile than blackberries. Boysenberry plants grow horizontally; however, blackberries grow more vertically. Both the boysenberry and blackberry are high in nutrients. For instance, boysenberry is particularly high in fiber and folate. Blackberry has other nutrients that stand out, such as vitamin C, vitamin K, and copper. These berries are both very high in manganese as well. Berries are a great summer fruit. They are light, and often admired for their juicy and sweet taste. And since boysenberries combine multiple berries, this further enhances their unique flavor profile. How do the flavor profiles of boysenberry and blackberry stack up? Blackberries are known for their tart and sweet flavor. It is also important to note that before blackberries are fully ripened, they are glossy and taste extremely tart. Once they have ripened, the berries become dull and dark in appearance, and as a result, they will taste sweet with a soft texture. Conversely, boysenberries are very juicy and have a wonderful balance between those tart and sweet flavors. The flavor of boysenberry also combines the juicy tang of blackberry and floral sweetness of raspberry. Overall, boysenberries have an intense, juicy, rich, tart, sweet, and unique flavor profile. The boysenberry is also soft, but perhaps more fragile than the blackberry. In this boysenberry vs. blackberry section, we will outline the uses of these berries. For boysenberries, growing season is short, and once picked, they are not very stable. Boysenberries are available during late spring and early summer, while the best blackberries can be picked between August and September. Boysenberries can be used in similar ways to blackberries. For instance, you can find them both in jellies, jams, preserves, pies, tarts, syrups, wines, smoothies, teas, and other desserts and baked goods. You can also freeze berries and thaw them for use at a later time. Moreover, you can see them added to appetizers and entrees in sauces. Boysenberry sauce in particular can be combined with black pepper, wine, and goat cheese on a rosemary flatbread. Boysenberry juice can also be reduced with juniper berries, beef stock, and mustard seed to create a savory and sweet sauce that can pair with roasted beef tenderloin. What about the health benefits of boysenberries and blackberries? When it comes to your health, blackberries and boysenberries also have similar uses. This is because both are loaded with antioxidants, such as anthocyanins. Both are considered important to improve and maintain brain health, boost immunity and fight infection and certain cancers, and also benefit cardiovascular health. The cancer-fighting abilities of blackberries are well-documented. A study published in the Journal of Biological Chemistry in 2006 found that a specific anthocyanin called cyanidin-3-0-glucoside in blackberries can effectively slow the growth of cancerous lung tumors. Boysenberries are thought to be beneficial for regulating blood pressure and triglyceride levels, while blackberries protect blood vessels, also due cyanidin-3-0-glucoside. Boysenberries may also be able to improve lung function, reduce epilepsy risk, and benefit digestion. Horticulturist Rudolph Boysen first cultivated boysenberries on his farm in California. George M. Darrow of the United States Department of Agriculture (USDA) and farmer Walter Knott tracked down Boysen’s berry, transplanted the plants, and nurtured them back to fruit-bearing health at what eventually became Knott’s Berry Farm in Buena, California. Knott’s Berry Farm became popular due to the boysenberry. Knott named the berries “boysenberries,” after the originator Boysen. Mostly commercially sold boysenberries are now grown in Oregon. In 2016, New Zealand was named the world’s largest producer and exporter of boysenberries. In mid-Mediterranean literature, it was insisted that Christ’s crown of thorns had been made from blackberry runners and the deep color of blackberry juice had represented the blood of Christ. Writer, explorer, and botanist John Bertram was one of the first to speak about blackberries. Although blackberries have been known since ancient times, it wasn’t until the late 1800s and 1900s when blackberry cultivation began. Mexico is considered the largest blackberry exporter. If you notice that your blackberry plant has turned orange, you need to destroy it. This is a major fungal disease that cannot be fixed. We have reached the end of our boysenberry vs. blackberry discussion. Is one berry better than the other? I don’t think you can go wrong with either berry. Both are high in nutrients such as fiber and manganese. Blackberries contain considerably more vitamin C, and boysenberries contain far more folate. Both berries are also quite sweet, juicy, and tart, and make a great addition for wines, syrups, preserves, jams, jellies, tarts, pies, teas, smoothies, and other baked goods and desserts. Due to the antioxidant content, boysenberries and blackberries are also great for your brain, immune system, heart health, and for fighting certain cancers. “Boysenberry,” New World Encyclopedia; http://www.newworldencyclopedia.org/entry/Boysenberry, last accessed July 24, 2018. “5 Amazing Benefits of Boysenberries,” StyleCraze, April 23, 2018; https://www.stylecraze.com/articles/amazing-benefits-of-boysenberries/#gref, last accessed July 24, 2018. “Blackberries, raw Nutrition Facts & Calories,” SELFNutritionData; http://nutritiondata.self.com/facts/fruits-and-fruit-juices/1848/2, last accessed July 24, 2018. Sterling, J., “Everything You Need to Know About Boysenberries,” Food & Wine, June 10, 2014; https://www.foodandwine.com/blogs/2014/06/10/everything-you-need-to-know-about-boysenberries, last accessed July 24, 2018. Stutzer, A., “How Blackberries Maintain Your Health (and Taste Good Doing It),” Organic Authority, August 1, 2012; http://www.organicauthority.com/health/how-blackberries-maintain-your-health-and-taste-good-doing-it.html, last accessed July 24, 2018. “Boysenberries,” Specialty Produce; http://www.specialtyproduce.com/produce/Boysenberries_105.php, last accessed July 24, 2018. Ding, M., et al., “Cyanidin-3-glucoside, a natural product derived from blackberry, exhibits chemopreventive and chemotherapeutic activity,” The Journal of Biological Chemistry, June 2006; 281(25): 17359-17368, doi: 10.1074/jbc.M600861200. 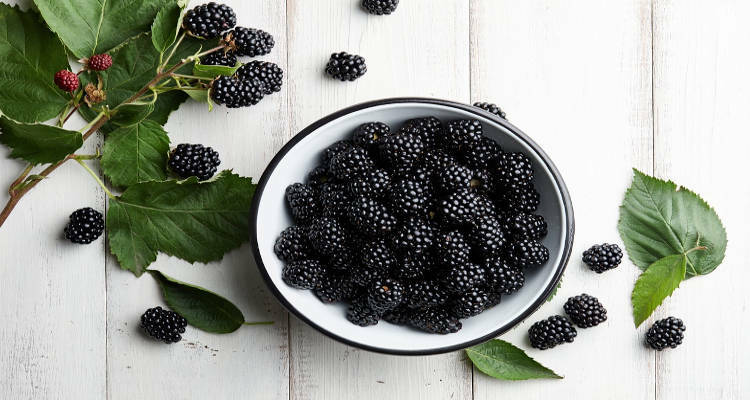 “6 Amazing Health Benefits of Blackberries,” Dr. Axe; https://draxe.com/health-benefits-blackberries/, last accessed July 24, 2018. 10. “7 Health Benefits of Boysenberries,” DoveMed; https://www.dovemed.com/healthy-living/natural-health/7-health-benefits-of-boysenberries/, last updated March 20, 2018. 11. Simms, D., “Blackberry Facts: 10 Things You May Not Know About the Fruit,” HuffPost; https://www.huffingtonpost.ca/2013/01/31/blackberry-facts_n_2581622.html, last updated Feb. 21, 2017.